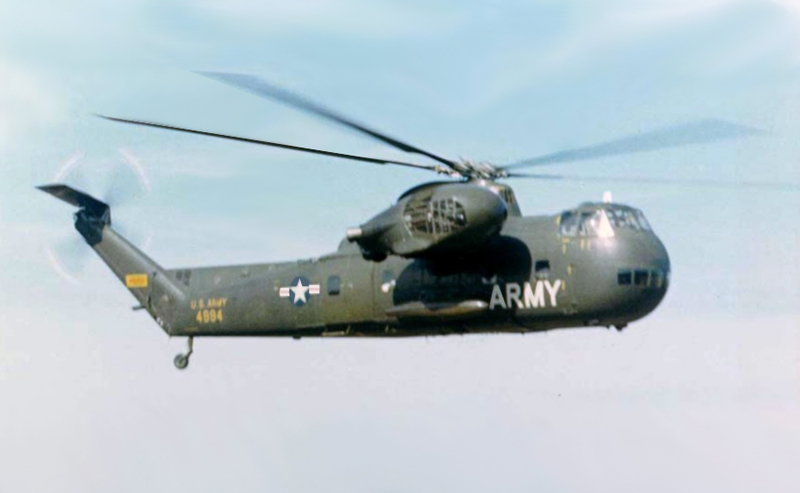 The theme for the 2019 Membership Directory History Section will be the CH-37 Mojave in Vietnam. Go here for details. You can now purchase clothing and accessories with the VHPA logo, including Life Member polo shirts online at the VHPA Gear Store. To enhance and accredit the cohesiveness, esprit de corps, and traditions of valor of rotary wing aircrews that flew in Southeast Asia during the Vietnam Era. To seek out, using whatever means available, individuals who piloted rotary wing aircraft in Southeast Asia during the Vietnam era and inform them of the existence of the VHPA and encourage all eligible individuals to become members. 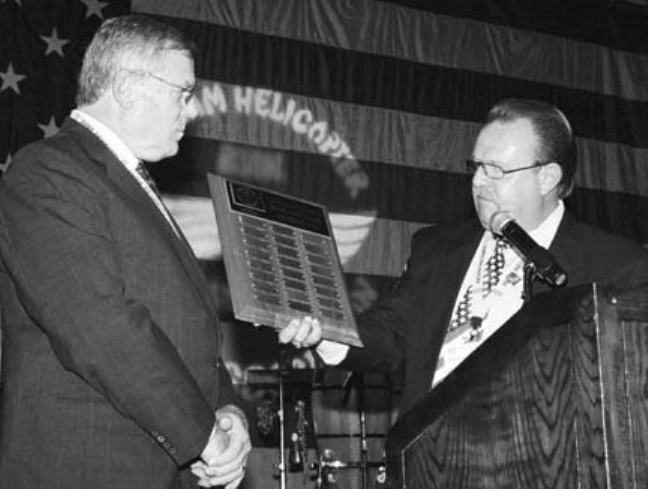 The VHPA has a membership of over 16,600 (8,700 dues current) helicopter pilots from around the world out of the approximately 40,000 who served as helicopter pilots in the Vietnam War. The VHPA publishes six magazines, a membership directory and a calendar each year and periodically publishes historical reference directories, CD-ROMs and DVDs. Magazines are included with VHPA membership and are available to non-members with a $36/year subscription. (Three years for $99) To contact the magazine editor aviator@vhpa.org. 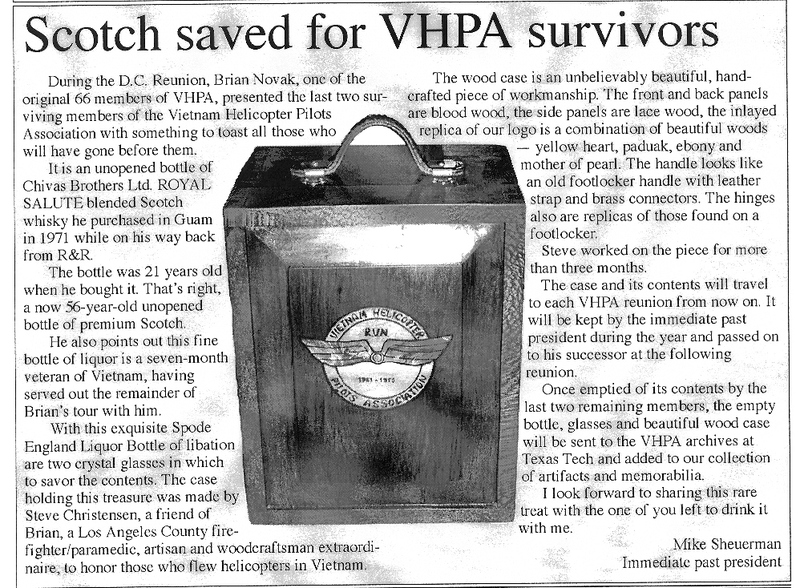 See an example of our magazine, The VHPA Aviator (big file). VHPA Aviator magazine advertising and other information. Please call HQ on 800-505-VHPA (8472) to sign up to be a life member. Traditions: The VHPA has developed some traditions over the years. One of those is the missing man table at the banquet at each reunion. Here is an example done at the 2005 reunion. 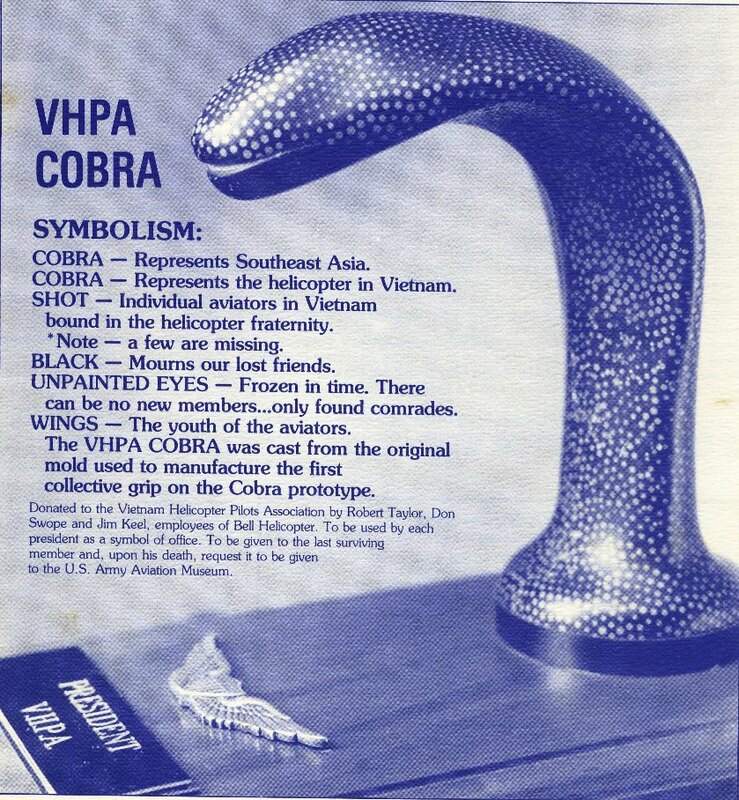 Another tradition started in 1988 is a "Cobra" plaque made from the mold for the AH-1G prototype collective grip. It is passed from outgoing President to incoming President at each reunion. Also passed from President to President is a plaque with past Presidents' names on it. A third tradition is a bottle of 21 year old Scotch purchased in 1971 by Brian Novak one of the original 66 founding members. History of the founding of the VHPA written by Larry Clark and Mike Law in 1990. Please note: This website may contain information that VHPA considers proprietary and confidential. Information contained herein shall not be used for commercial solicitation purposes, or any correspondence related thereto. Correspondence relating to commercial purposes or solicitations shall only be sent to webmaster@vhpa.org whereupon it will be forwarded to the appropriate VHPA representative. Member information contained in this publication shall not be distributed to non-VHPA members without the express consent of the member. Use this form to apply for membership online. For a membership form to print and mail, click here. Please use the membership application form to submit address changes for the directory and use the comments form to submit other directory changes and updates. Online membership directory for dues current members.